Applications to join the youth orchestra are now being accepted! 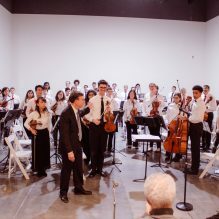 The renowned Cleveland Pops Orchestra, in collaboration with The Music Settlement, has established The Cleveland Pops Youth Orchestra to nurture and train young musicians to reach their full potential while promoting critical thinking, self-confidence, and leadership skills through music. Perform two different programs, plus side by side with the renowned Cleveland Pops Orchestra at their holiday concert! Season two begins this fall! The Cleveland Pops Youth Orchestra rehearses on Mondays from 6:00 to 8:00 pm at The Music Settlement, starting on Monday, September 30. Auditions consist of a solo piece of the applicant’s choice. Auditions may be performed either in person or electronically (via video submission). Auditions for the new ensemble will be open to intermediate-to-advanced skill level string, woodwind and brass students ages 12 to 18. April 2019: To Apply Click Here! Auditions for fall semester are being offered in person at The Music Settlement on Monday, April 29th from 4-6pm and Monday, May 20th from 4-7pm. You may also make a submission electronically (through video submission). Special visits to high schools may occur if these options are not feasible.